Kashida (Persian: کشیده‎) is a type of justification used in some cursive scripts, particularly Arabic. In contrast to white-space justification, which increases the length of a line of text by expanding spaces between words or individual letters, kashida justification is accomplished by elongating characters at certain chosen points. Kashida justification can be combined with white-space justification to various extents. The analog in European (Latin-based) typography (expanding or contracting letters to improve spacing) is sometimes called expansion, and falls within microtypography. Kashida is considerably easier and more flexible, however, because Arabic-Persian scripts feature prominent horizontal strokes, whose length is accordingly flexible. Kashida can also refer to a character representing this elongation (ـ) (also known as tatweel or taṭwīl - تطويل taṭwīl), or to one of a set of glyphs of varying lengths that are used to implement this elongation in a font. The Unicode standard assigns codepoint U+0640 as "Arabic Tatweel". 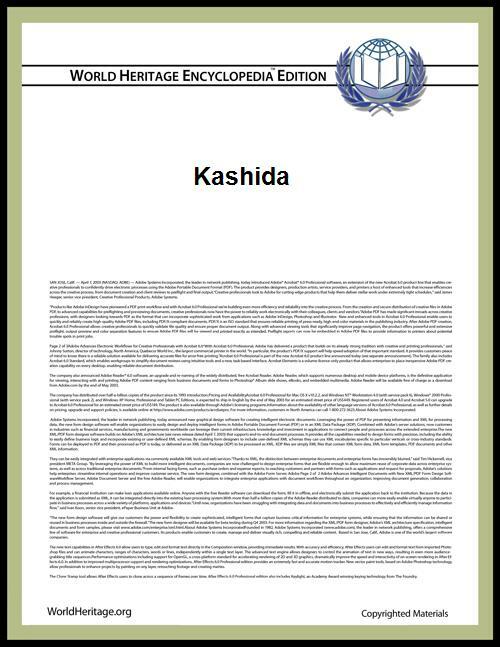 Kashida or Keshida is a Persian word meaning extended or drawn. This typography-related article is a stub. You can help World Heritage Encyclopedia by expanding it.